Pink Paislee just released a new collection called SUMMER LIGHTS and I've been having a blast playing with it! The colors are right up my color-lovin' alley. DESCRIPTION: I've still got about 20,280,183 doily shapes in my library that I haven't used so... another large doily background it is! JOURNALING SAYS: Random pics of you are my favorite - a moment in time captured. (The main layout photo was apparently taken before I added the journaling directly on the photo - you can see it in the detail shots below and in the process video at the end). 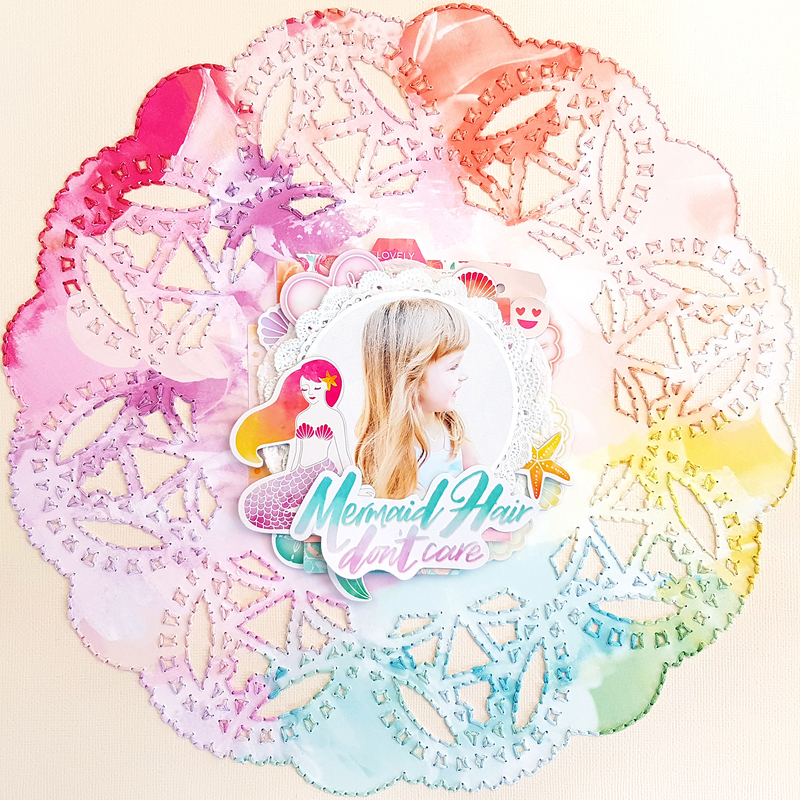 HOW TO: Die cut a doily from Paper 08 of the Summer Lights collection by Pink Paislee then use spray adhesive to attach it to a vanilla cardstock background. Pierce a hole every 1/8" or so around the entire doily. Backstitch through the holes using colors of thread that match the colors of the patterned paper. I loooove the texture it adds! In the center of the page, adhere a photo onto doilies and layer in die cuts, stickers, and chipboard. Use a white pen to journal directly on the photo. I've already made another layout and an entire mini album with the Summer Lights collection that I'll share soon! Seriously GORGEOUS! I loveeeeeeee this!!!! I loveeeee that random photo of Jane, loving that doily and LOVE LOVE LOVE the stitching!!!!!!!!!!!!!!!!!!!!!!! !